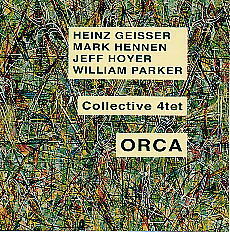 The "Collective 4tet" comprises of Heinz Geisser (drums), Mark Hennen (piano), Jeff Hoyer (trombone) and William Parker (bass). This is their second CD on Leo Lab; the first, Ropedancer, received some outstanding reviews. Collective 4tet is destined to become a supergroup. As Ben Watson writes in his liner notes, when this group plays, the history of jazz is still being made.